Thanks to all participants for the successful “Make It and Give It Away” event last month with our volunteers and YWCA partners. 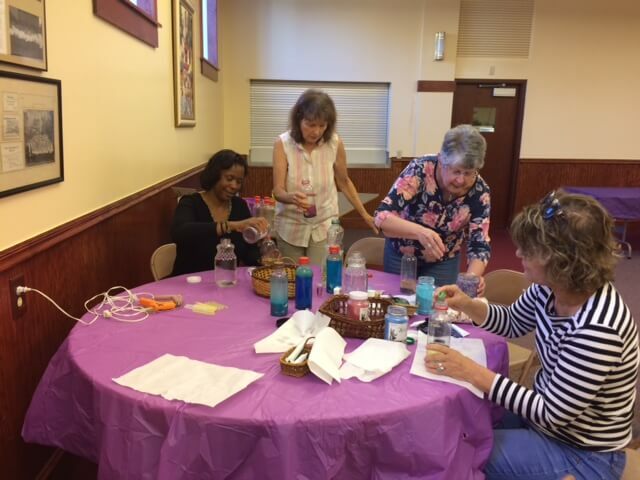 Together we made sensory resources – ocean-in-a-bottle, weighted lap pillows, jars with essential oils, hand fidgets made of hair ties, and de-stress balloon balls. These items for students who have experienced trauma will help them regulate their emotions in the classroom. Bins with each type of sensory resource, a letter, information packet that explains each sensory activity, and gift certificate for the teacher will go to local K-3rd grade teachers to support their efforts in creating positive learning environments for all kids! Here are pictures from the event, where conversations were sparked, questions asked, personal stories shared and relationships built while the work was done. Special thanks to Task Force members Theresa Outz and Ginny Middleton, who organized this event with help from retired Occupational Therapist Teri Olbrot and YWCA partners Cherish Davis and Laurie Fletcher. This month the community Trauma and Resilience Workgroup, to which ISAAC belongs, is sending 5 individuals from partner organizations and two observers to become trainers regarding the new documentary, RESILIENCE: The Biology of Stress and the Science of Hope. Sponsored by the Michigan ACES (Adverse Childhood Experiences) Initiative, this training will help us achieve our goal of creating a trauma-informed and trauma-responsive community. 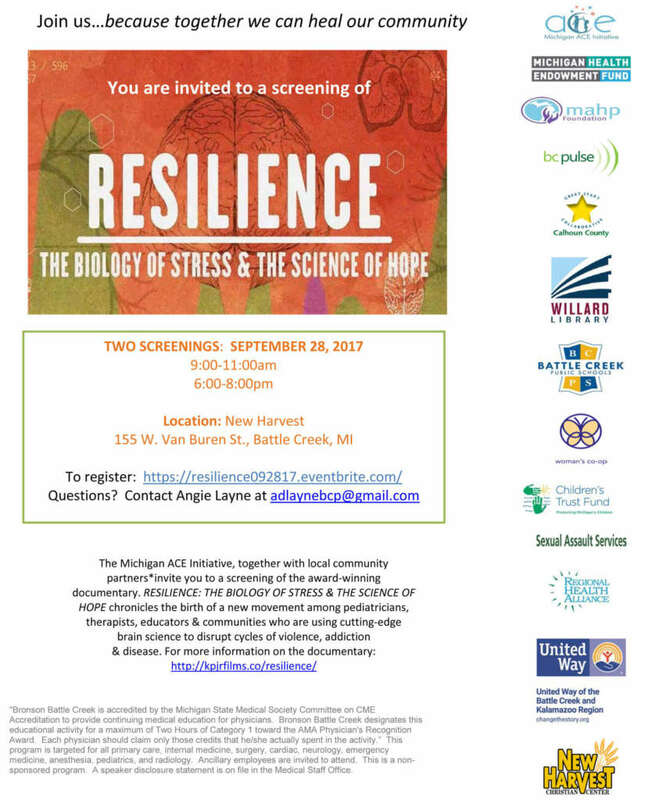 Screenings of the documentary will support our countywide efforts to help build resilience with all our county’s children and families. The next screenings are scheduled for Thursday, September 28 in Battle Creek, 9-11am and 6-8pm at New Harvest, 155 W. Van Buren Street. Community members are welcome to register at https://resilience092817.eventbrite.com/ and to direct questions to Angie Layne at [email protected]. The next showing in Kalamazoo is October 31 and is for the juvenile court system. Judges, referees, probation workers and juvenile home staff will see and discuss the film; law enforcement, elected officials and community members may attend as space permits. Look for registration information in October. Our Task Force, volunteers and partners are increasing community awareness as a step toward addressing ACEs in Kalamazoo County!